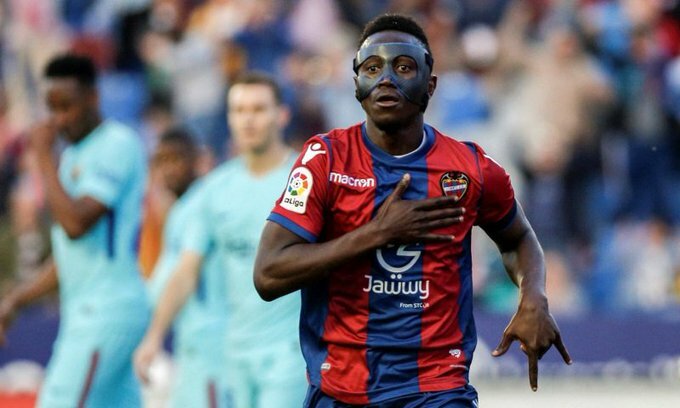 UD Levante are willing to sell Emmanuel Boateng to Chinese Super League club Dalian Yifang for €11m, according to reports in Spain. The Ghanaian striker joined the La Liga side from Portuguese outfit Moireirense in the summer of 2017 but has struggled for form this season, netting just once in 16 La Liga appearances. Superdeporte says the forward will move to the Far East in a deal worth €11m, which will be the second highest transfer in Levante’s history following Jefferson Lerma’s €30m move to Bournemouth this summer. The 22-year-old is popularly remembered for scoring a hat-trick in a memorable 5-4 victory at home to Barcelona last May but is set to undergo a medical in Madrid for a move away on Monday.